Sechs kleine Klavierstücke [Seis pequeñas piezas para piano, música de Arnold Schoenberg, ejecutada por Juan María Solare. Grabado en el Teatro de la universidad de Bremen (Alemania) el 25 de julio de 2014. Portada por la artista británica Catherine Archer-Wills. Lanzamiento: 13 de diciembre de 2014. 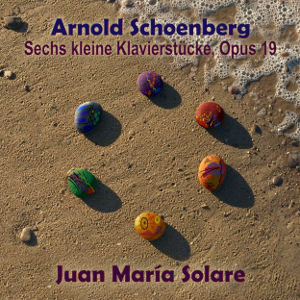 Sechs kleine Klavierstücke [Six Little Piano Pieces]: 6 miniatures for piano, music by Arnold Schoenberg, performed by Juan María Solare. Recorded at the Theatersaal of the Universität Bremen (Germany) on 25 July 2014. Cover Art by the British artist Catherine Archer-Wills. Although composed already in 1911, these six piano expressionist miniatures can still sound extremely modern to most ears, which tells us not necessarily how advanced were Schoenberg for his time, but rather how times have slowed down since. These six pieces, "dialectic in miniature" (Matthew Greenbaum) are basically atonal, which in this context means that they do not rely on a single note as centre, but on the relationships among notes (i.e. in the intervals) to achieve personality, a particular sonority, coherence and a sensation of completeness. For instance, in the second piece the main interval is the third (both major and minor) and in the sixth piece it is clearly the perfect fourth. It has been pointed out several times how close these pieces are to tonality, which is on my view both correct and misguiding. Correct because, if you make all the necessary juggling, you can demonstrate everything. Misguiding because that assumption actually means that we are not willingly to find the New and analyse it (or enjoy it) as such, eventually developing new analysis devices (or listening attitudes), but we rather prefer to see innovation only as a natural consequence of the present (or past) state of things. And since every new step is based on something pre-existing, nothing can be really new, and true innovation is just illusion - according to such static view (which is not mine, mind you). In other words, it would be unfair to reproach retrospectively (decades after) a single innovator that he has not been revolutionary enough. From an aesthetical point of view, these six gems offer a self-contained world, an abstract world; abstract as a desert is abstract and full of hidden life; fascinating (for both performer and listener) once we can get into it. I am aware that this kind of world of finesse and subtleness is not necessarily the one that most people are used to (mainly if they prefer to listen -and contemplate- to Lady Gaga, Madonna or Beyoncé). One of my teachers (Juan Pedro Franze) was quite sceptical about Arnold Schoenberg. He asked rhetorically: "how many of you did awake singing a tune by Schoenberg?" I can tell you that I did it at least twice. "Solare bewies mit diesem Konzert, dass er gestalterisch wie spieltechnisch ein kompetenter Pianist der Avantgarde ist. (...) die 6 kleinen Stücke für Klavier, op. 19, von Arnold Schönberg habe ich selten so polyphon und gleichzeitig organisch kompakt gehört." 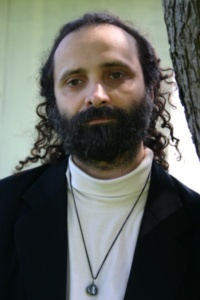 "Solare demonstrated with this concert that he is a competent pianist of the avant-garde. (...) I seldom listened the 6 little pieces for piano op. 19 by Arnold Schönberg so polyphonic and at the same time organic compact." "Solare demostró con este concierto que es -interpretativa y técnicamente- un competente pianista de la [música de] vanguardia. (...) Pocas veces escuché las 6 pequeñas piezas para piano opus 19 de Arnold Schönberg de manera tan polifónica y al mismo tiempo orgánicamente compacta." I am extremely satisfied that British artist Catherine Archer-Wills made the cover art for this release. On her picture you will see six pebbles (representing each music piece) forming a circle. Since Schoenberg's work might be compared to Wassily Kandinsky's paintings (and there is an extensive correspondence between Kandinsky and Schoenberg during Schoenberg's expressionist period), Catherine painted each of the pebbles in the style of Kandinsky - "I listened carefully to each piece and drew what I heard, and took some pebble photos on the beach." About the font used: she has left the text severely plain in a Bauhaus style.